If you want to setup your e-commerce business, that means you have to strategize and manage a lot of things. Setting up an e-commerce store is not that much easy if your foundation is not strong. In today’s scenario, the business owners are looking for best platforms for their e-commerce websites development, and magento is the best solution to fulfill all their needs. If you are still confused that why magento e-commerce development has gained so much popularity or even attention of the e-commerce website developers, here are the top 10 advantages of magento. 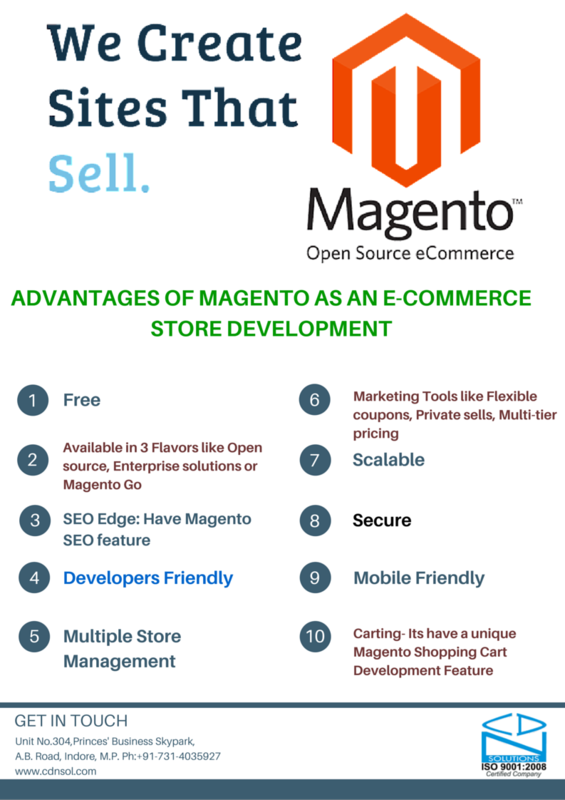 1) Free: Magento is an opensource platform and hence has a lot of features that are completely free. It is a big and fast-growing technology. Developers also like magento because of its uniqueness and thousands of extensions. 2) Available in 3 Flavors: – Magento is available in 3 different flavors. 3) SEO Edge: – Magento has a unique feature i.e ‘Magento SEO’. Magento seo has solved multiple issues by facilitating this unique feature. By this feature, the e-commerce site is better optimized. Duplicate content, page traffic, indexing, landing pages are efficiently managed by magento seo. 4) Developers Friendly: Magento developers finds it easy and friendly to add pages and update content to the website. The linking and navigation of pages is also very easy in magento, and these features saves considerable amount of time of developers. 5) Multiple Store Management: With magento, running and managing online business 24-7 has become stress-free. Before magento, managing multiple stores from single administrative panel was inconvenient. Now with magento, each store can be setup in single admin panel with its unique product catalogue. 6) Marketing Tools: Magento have various tools and technologies to promote your e-commerce business. It collects many unique options like flexible coupons, private sales, Multi-tier pricing, Landing pages tools for campaigns etc. 7) Carting: Magento shopping cart development is a very user friendly feature and it helps customers to follow the step by step process for purchasing the desired product. It also provide many payment gateway options to customers. 8) Scalable: Magento is written in php, so it is very easy to add new features according to the project need and this will scale your solution. 9) Secure: Magento is very secure, if your server running on a separate system, the information of your online store, products, records of customers, orders and transactions are completely private with no third party access. 10) Mobile Friendly: Last but not least, Magento is mobile friendly too. The mobile apps of magento allows store integration across multiple devices to work efficiently on Smartphones, Notebook, iPad etc. Magento is a well built platform in all the terms either it is security or stability. Many e-commerce web development companies have adopted this open source platform open hearty. CDN Solutions Group being a pioneer in developing web apps, have also developed many magento e-commerce websites that are running successfully, and have many talented developers who are experts in this platform. If you also want to develop your e-commerce business using magento, then please contact us here.